Hi friends! Hope that you are all doing well! I am blogging a ton this week since I have so many things going on. I hope that's ok with you all! I promise that I'll try to keep it short. Today, I have a couple cards made with the BRAND NEW stamps being release from Wilson Designs Stamps on June 8th! They are SOOO cute! I was given one set to design with this month and it's super fun! I know you all will love it! Here's my first card. I mixed this with the polaroid frame from Everything's Owlright. The paper is from Echo Park. 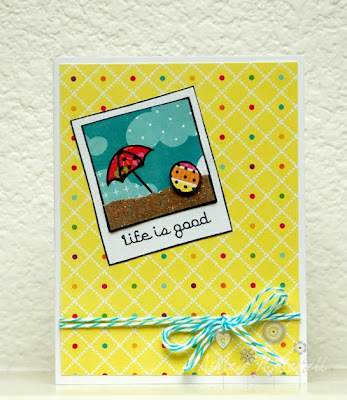 And here's a card I made an image and sentiment from one of the new sets. The paper is from Basic Grey. What super cute cards dearie!! So glad that you are the GD this month for Wilson Designs!!! awesome cards Ashley, love that polaroid frame! Such great cards - I love all the colors! I need to get my hands on that Polaroid stamp soon. Very cute cards. I can't wait to see all the new stamps!! What cute, fun and happy cards! Love the cards! The are so bright and love the stamps. very cute, love how CAS this is! These are adorable Ashley! I like how you combined the vacation theme with the polaroid photo from Kim's other set to create your first card and I love the bright summery colors you used in both of your cards! I am so excited for the reveal tomorrow evening! Both are so incredibly cute. Great job! Hi Ashley! I'm so glad to see you here this month during the WD release! Congrats on the guest designer spot! I love your mix-up card using the polaroid stamp...such a cute little scene!!! 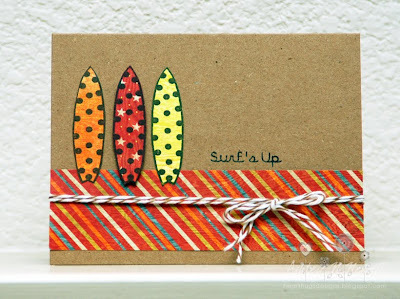 I really like the sideways paper under the surfboards. It makes me think of beach towels, even though it doesn't have beach towels. Go figure. Anyway, I love the colors and the print. You did a great job! Both cards are wonderful! I really love the surfboards in the 2nd card! I just adore the way you paper pieced the stamped images! So cute!